We’ve known since October that Captain America is totally going to die in Avengers 4, mostly because Chris Evans posted an emotional goodbye to the character on Twitter when he finished his work on the still-untitled movie (still untitled!). Evans later tried to deny that he was saying Cap would die, saying his message was just about his time playing the character and not any particular things that may happen to the character, but it still seemed like he was lying. 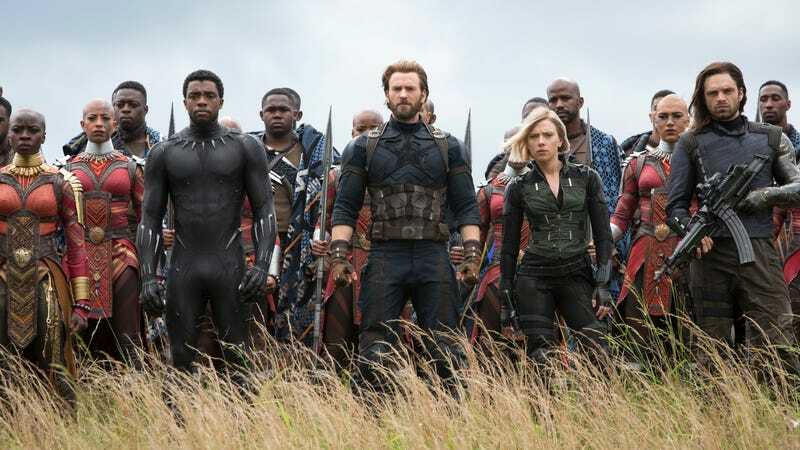 Now, though, Joe Russo—one of the brothers directing Avengers 4—has muddied things up even more by telling USA Today that Evans’ goodbye was more emotional for him than it was for the Russos because Evans is “not done yet.” He specifically noted that he wouldn’t say what that meant, but he teased that audience would figure it out soon enough. This is a wild twist in the whole “Cap’s gonna die” conspiracy, as it seems like Russo is implying that Chris Evans doesn’t realize that he still has some work to do as Cap. Or maybe the Russos are doing something more with Cap that doesn’t involve Evans? It’s weird either way, so we’re just going to leave it alone until Avengers 4 comes out and starts answering these questions. Luckily, the Russo brothers recently stopped by a special Infinity War screening, and they dropped a handful of other Avengers reveals that we can make more sense of. For starters, a Collider story says the Russos did considering bringing in the Netflix heroes (Daredevil, Luke Cage, Iron Fist, and Jessica Jones) at some point, but the madness of wrangling the canon of a bunch of different movies was already too much work for the Russos without throwing four TV shows into the mix. They also revealed that there were three “radically different” versions of the Infinity War script, with one being a non-linear saga with Thanos as the narrator of the story that dug into the origin of his Black Order. When that script got too long, they decided to use it as the “bible for the movie,” utilizing Thanos’ narration to give them an insight into his motives. They also shot down a surprisingly stupid fan theory about Loki faking his death in the beginning of the movie by disguising himself as Bruce Banner. Seriously, when would Loki have made that switch? And why would Banner halfway turn into the Hulk a few times? If it was actually Loki, was he just doing that for the audience’s benefit? Because that’s silly. Anyway, that’s not what happened and Loki is actually dead—at least until the Avengers figure out how to undo Thanos’ whole rampage, and they will.